Water rushes through the pipes and fans whir inside the hydroponic growing system that Belleque Family Farms has set up inside a converted shipping container. Kyle Belleque crouches low to inspect the spinach plant on the bottom shelf of his garden. “Makes me want to have a spinach sandwich,” Belleque said as he picked a deep green leaf and munches on it. 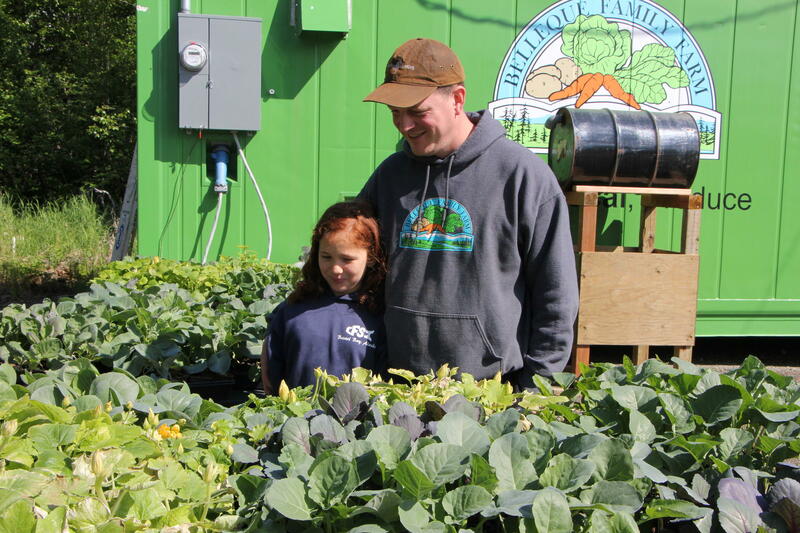 This Dillingham farm is making a concerted effort to provide fresh greens year-round. They grow everything from butterhead lettuce and chard to basil and mountain mint on floor to ceiling shelves that run the length of the container. Belleque points out a new product on a shelf across the narrow aisle. Belleque Family Farms is something of an experiment itself. 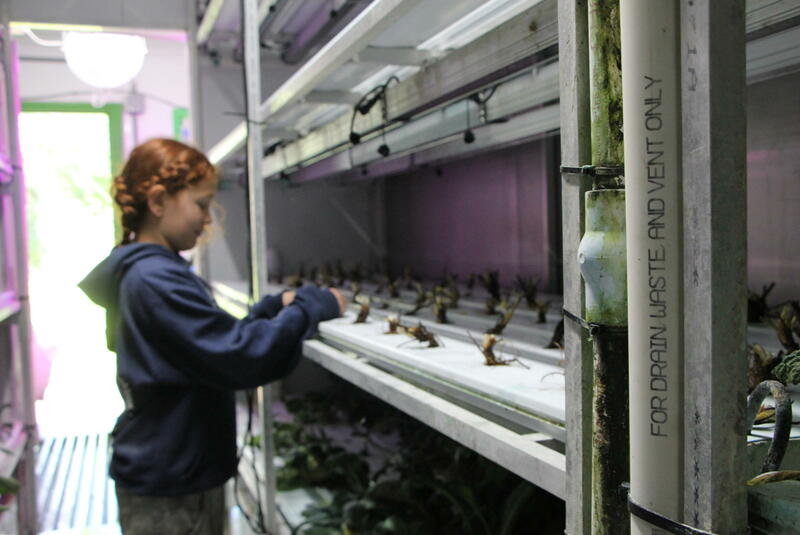 They are mastering hydroponic technology, testing different plant varieties, and now they’re trying out a new business model. In November, they began selling to grocery stores in Dillingham. But Belleque said that after a few months it became clear that model wasn’t sustainable for his produce. When the grocery stores stopped buying their greens, they decided to try something new. Amy Belleque plants bare root strawberries. Last week, Belleque Family Farms began selling shares of their harvest. $40 dollars a week buys a share of 10 units a week. An ounce of basil or a head of greens each count as a unit. Subscribers can visit the farm twice a week to pick out their greens. Initially, they are offering five subscriptions. So far, four people have signed on. Once the new system is established, Belleque anticipates that their growing capacity will allow them to sell 20 or 30 shares. They also want to continue providing fresh greens to the Dillingham City School District during the school year. In a place where many people already eat off the land, collecting and preserving fish, game and berries, Belleque sees this hydroponic farm as one more opportunity to eat locally year round.